Welcome to Purposed Physical Therapy's patient resource about Osteoarthritis of the Acromioclavicular Joint. Some joints in the body are more likely to develop problems from normal wear and tear. Degeneration causes the cartilage that cushions the joint to wear out. This type of arthritis is called osteoarthritis. Doctors sometimes refer to this type of arthritis as arthrosis. 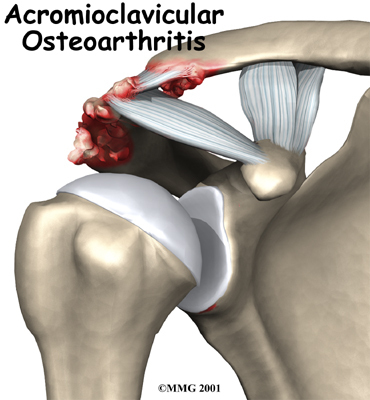 The acromioclavicular (AC) joint in the shoulder is a common spot for osteoarthritis to develop in middle age. 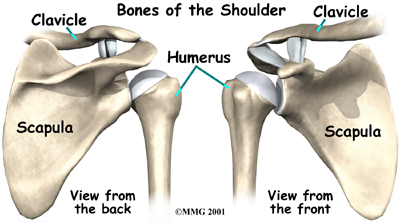 Degeneration of the AC joint can be painful and can cause difficulty using the shoulder for everyday activities. What exactly is the AC joint? The part of the scapula that makes up the roof of the shoulder and connects with the clavicle is called the acromion. The joint where the acromion and the clavicle join is the AC joint. In some ways, the AC joint is like any other joint. It has two bones that need to connect but be flexible as well. The ends of the bones are covered with articular cartilage. Articular cartilage provides a slick, rubbery surface that allows the bones to glide over each other as you move. Cartilage also functions as sort of a shock absorber. However, the AC joint is different from joints like the knee or ankle, because it doesn't need to move very much. The AC joint only needs to be flexible enough for the shoulder to move freely. The AC joint just shifts a bit as the shoulder moves. Why does degeneration of the AC joint occur? We use our shoulder constantly. The resulting strain makes AC joint osteoarthritis a common disorder. The AC joint is under constant stress as the arm is used overhead. Weightlifters and others who repeatedly lift heavy amounts of weight overhead tend to have an increased incidence of the condition, and often at a younger age. Poor posture can also contribute to osteoarthritis. Without proper alignment in the upper back and shoulders, the AC joint can't function efficiently leading to increased strain on the ligaments and joint surfaces with daily use or sports activities. AC joint osteoarthritis may also develop following an injury to the joint, such as an AC joint separation. This injury is fairly common. A separation usually results from falling on the shoulder. The shoulder does heal, but many years later degeneration causes the AC joint to become painful. In its early stages, AC joint osteoarthritis usually causes pain and tenderness in the front of the shoulder around the joint. The pain is often worse when the arm is brought across the chest, since this motion compresses the joint. The pain is vague and may spread to include the shoulder, the front of the chest, and the neck. If the joint has been injured in the past, there may be a bigger bump over the joint on the affected shoulder than on the unaffected shoulder. The joint may also click or snap as it moves. When you visit Purposed Physical Therapy, our Physical Therapist will first want to get a detailed medical history, including questions about your condition and how it is affecting you. We will want to know about any past injuries to your shoulder. Our Physical Therapist may ask you to rate your pain on a scale of one to ten, and will want to know how much your pain affects your daily tasks. Diagnosis of AC joint osteoarthritis is usually made by physical examination. The AC joint is usually tender. A key finding is pain as the joint is compressed. To test for this, your arm is pulled gently across your chest. Initial treatment for AC joint osteoarthritis usually consists of rest and anti-inflammatory medications such as aspirin or ibuprofen. Ensure that you consult with your doctor or pharmacist regarding the use of pain relief or anti-inflammatory medication. Then a personalized rehabilitation program can be developed by your Physical Therapist. If you don't need surgery, we will begin range-of-motion exercises as your pain eases, followed by a program of strengthening. At first, exercises are done with the arm kept below shoulder level. The program then advances to include strength exercises for the rotator cuff and shoulder blade muscles. Our goal is to get your shoulder moving smoothly and to learn how to control your symptoms. We may also need to correct your posture to improve the biomechanics of the shoulder and AC joint. Although the time required for recovery varies, as a guideline, you will probably progress to a home program within four to six weeks. 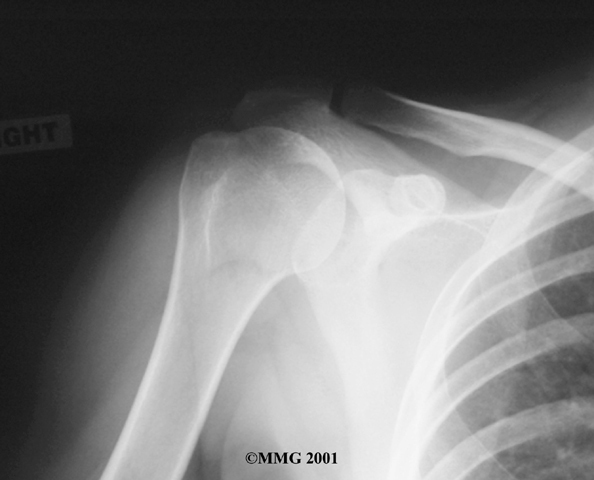 Your surgeon may have you wear a sling to support and protect the shoulder for a few days. Then our Physical Therapist can begin your recovery program. The first few Physical Therapy treatments will focus on controlling the pain and swelling from surgery. Ice and electrical stimulation treatments may help. Our Physical Therapist may also use massage and other types of hands-on treatments to ease muscle spasm and pain. 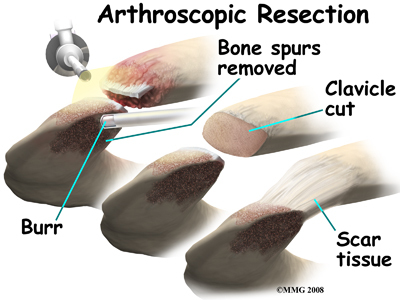 Physical Therapy can progress safely and quickly after a simple arthroscopic resection. Our treatments start with postural and range-of-motion exercises and gradually work into active stretching and strengthening. You need to avoid doing too much, too quickly. Physical Therapy goes slower after surgeries where an incision is made through the shoulder muscles. Our therapists usually wait up to two weeks before starting range-of-motion exercises. You will begin with passive exercises. In passive exercises, our therapist moves your shoulder joint while your muscles stay relaxed. We gently move your joint and gradually stretch your arm. Our Physical Therapist may also show you how to do passive exercises at home. Active therapy usually starts after four to six weeks. Active range-of-motion exercises help you regain shoulder movement using your own muscle power. Our Physical Therapist may have you begin with postural and light isometric strengthening exercises. These exercises work the muscles without straining the healing joint. At about six weeks, you may be able to start more active strengthening. Exercises will focus on improving strength and control of the rotator cuff muscles and the muscles around the shoulder blade. Our Physical Therapist will help you retrain these muscles to keep the ball of the humerus centered in the socket. This helps your shoulder move smoothly during all your activities. Some of the exercises you'll do are designed to get your shoulder working in ways that are similar to your work tasks and sport activities. Our therapist will help you find ways to do your tasks that don't put too much stress on your shoulder. Before your Physical Therapy sessions end, we will teach you a number of ways to avoid future problems. Diagnosis of AC joint osteoarthritis is usually made by physical examination. The AC joint is usually tender. A key finding is pain as the joint is compressed. To test for this, your arm is pulled gently across your chest. Your doctor may inject a local anesthetic such as lidocaine into the joint. If the AC joint is the problem, the injection will temporarily reduce the pain. Your doctor may want to take X-rays of the AC joint. 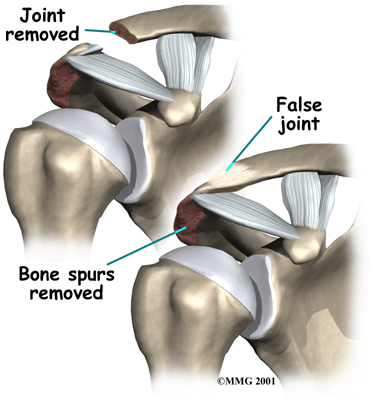 X-rays can show narrowing of the joint and bone spurs around the joint, which are signs of degeneration. If the pain doesn't go away, an injection of cortisone into the joint may help. Cortisone is a strong medication that decreases inflammation and reduces pain. Cortisone's effects are often temporary, but it can give very effective relief in the short term. If nonsurgical measures fail to relieve your pain, your doctor may recommend surgery. The older open method of performing this operation is done by making a small incision, less than two inches long, over the AC joint. The AC joint is very close to the surface of the skin and can be easily reached through a small incision. The surgeon can then use a special saw or other instrument to shave off a small portion of the end of the clavicle.